We received Katamino Family to review. All thoughts are mine because friends don't let friends play boring games. Do your kids ever claim they're bored? OK, OK, that was clearly a silly question. OF COURSE they say that. Mine do too even when I know there is no possible way they could be bored two seconds after they open their eyes in the morning. 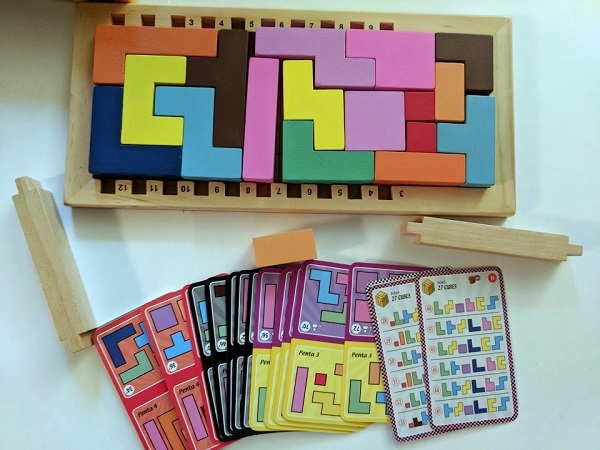 Well, when the kids (and you) want to do something a little different – something that stimulates your brain – then you need a puzzle game! Katamino Family by Gigamic is the newest game in the Katamino puzzle game line. I love that it's essentially three games in one. 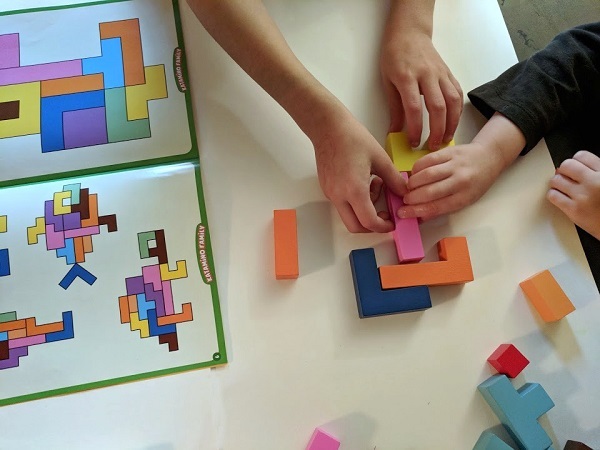 There are different puzzle activities (complete with instructions to follow) and head-to-head puzzle competitions. The puzzle guide was perfect for my younger child. There was no reading involved – he was able to look at the picture and recreate the puzzles that way. It's a great way for him to practice following directions. Plus, he added his own creative spin (like giving the fish a red eye). 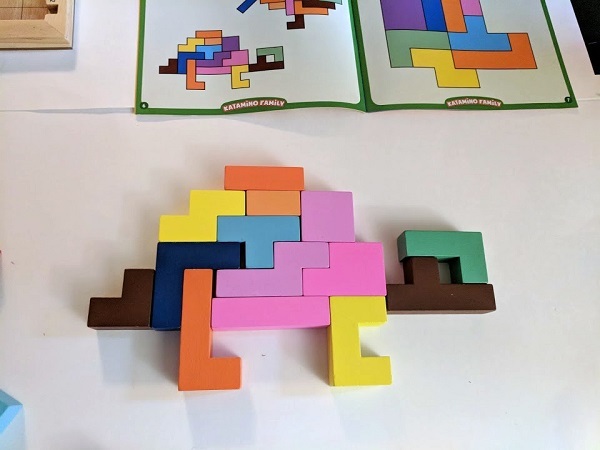 Even when he wasn't following the activity guide, he enjoyed stacking the pieces. The best part is the two player puzzle game (in my opinion). You select a card, which shows you which pieces you need to use in your tangram puzzle. The first person to complete their puzzle wins that round. Your space increases by one row and your opponent decides which piece to add to your set. Then the fun starts again! When we first played, my daughter and I had the same difficulty level on the card. 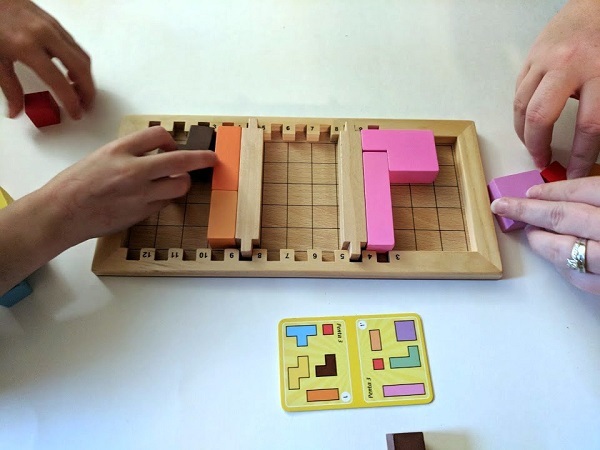 Since I have more experience with interlocking puzzling games, I solved mine quickly. To keep me from having such an advantage, I could either delay my start time (and let her have a head start) OR we could draw a card that had two different difficulty levels on it. I really like how there are varying difficulty levels for this wooden puzzle game. It makes it more fun for the whole family to play. We had a blast taking turns competing against one another. I love how it challenges us to think differently and figure out the solution by problem solving. This is a fantastic family game that you should add to your collection. Look for Katamino Family at your local game store! Stay up-to-date on the latest games with Gigamic World on Facebook!